Our vision is to be a recognized national leader in the preparation of skilled professionals in: civil engineering technology; environmental sustainability, health and safety management and construction management. We envision our graduates as prepared and committed to moving us toward a more sustainable and socially responsible future. The CETEMS mission is to achieve its vision by creating and maintaining an optimal teaching and learning environment in which staff and faculty grow professionally and students receive unsurpassed knowledge, skills, insights and the tools for lifelong learning in their respective disciplines. Adapting and combining the musings on education of several great philosophers, CETEMS views education as the key to creating and sustaining civilization (Plato); recognizes that human nature, routines of behavior, and social reality are important influences in the process of education (Aristotle); and seeks to cultivate curiosity in students as a primary behavioral manifestation of human education (Rousseau). Having a safe and healthy environment is requisite to a prosperous civilization. Work effectively with industry to provide cooperative education experience and applied research opportunities for our students. Deliver academic programs in multiple formats to meet the needs of full-time and part-time students and the needs of distant as well as local students. Provide state-of-the-art facilities that encourage learning, student project work and applied research. Incorporate continuous improvement into the work plans of faculty and staff, as well as into maintain and upgrading curriculum and facilities. The Bachelor of Science degrees in civil engineering technology are accredited by the Engineering Technology Accreditation Commission of ABET. WXXI’s “Connections” program features Kimie Romeo, adjunct professor of environmental health. RIT’s Bachelor of Science degree in civil engineering technology prepares students to enter careers in construction management, civil design, structural design, or environmental controls. The curriculum uses a combination of challenging academics, hands-on laboratory experiences, and practical cooperative work education to cultivate students who are grounded in applications-oriented approaches to solving the world's problems. RIT’s environmental sustainability, health and safety BS degree prepares its graduates to work as environmental sustainability, health and safety (EHS) project and program specialists and managers for organizations in industry and government. Graduates of our program help industries produce goods and services without contaminating the environment, without subjecting the workers to hazardous conditions and chemicals, and using less energy and fewer precious resources. The online Master of Science degree in environmental, health and safety management provides a solid foundation in the managerial aspects needed to develop and implement environmental, health and safety management systems that can move organizations toward a more sustainable and socially responsible future. Program graduates have a solid technical foundation in air emissions, wastewater, solid and hazardous waste, occupational safety and occupational health (industrial hygiene). 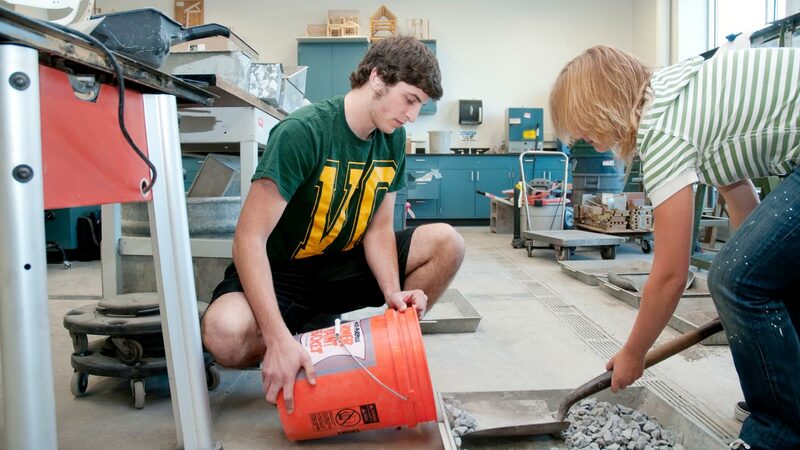 Elements of sustainability are integrated into most of the core courses and some electives. The online MS degree program in construction management is designed to develop competencies in leadership, construction cost analysis and control, construction operations management, and construction business development. The goals of the program are to provide graduates with the requisite strategic skills to lead and advance the construction industry. To accommodate the working professional, the program is available almost entirely online. The CETEMS Department Industrial Advisory Board is comprised of successful engineers, managers, and leaders who work at various businesses throughout the world. Together they review the CETEMS department curriculum to ensure that our program remains up-to-date and responds to industry changes. The committee has annual meetings at the end of the academic year. Learn more about the professionals that comprise our advisory committee. Each year, RIT’s Civil Engineering Technology students design and build a concrete canoe, proving that in the hands of creative engineers, concrete can be made to float. Take a tour of the inaugural Imagine RIT: Innovation and Creativity Festival. This video presentation offers just a sample of the many highlights from May 3, 2008, that helped make the debut of Imagine RIT such a success.